Blockbuster Book! Read about everything you ever wanted to know about the economy and the wealthy 1%, including fundamental issues that are at the core of the Occupy Movement’s list of grievances—all neatly outlined in one book, “Occupy World Street” by Ross Jackson—it’s aims and purpose and the underlying practices of how the elite 1% are enriching themselves at the expense of the 99% majority and why democracy has failed in the US; certainly a ‘Must Read’ for every person in the US. Even though it addresses these issues, this book does not exude a tone of doom and gloom nor is it chalked up with radical left-wing conspiracies or propaganda. 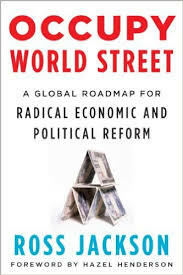 Rather, the author backs up all his claims with strong evidence and offers a road map to economic recovery and sustainability and a concrete vision for a new society, which favors not mere economic growth and greed but rather serving all of humanity rather than only the wealthy elite and “the corporatocracy”. The author, Ross Jackson, is at the forefront of this transformation—spearheading Ecovillages and offering new models for almost all aspects of civilization. This book is neutral and not politically aligned to any party or corporation, the author states facts as they are and reveals many hidden facts that most of us in the US are not aware of, the author is wealthy and has no ulterior motives, this book is set to become a best seller. This book is no urban legend or conspiracy theory; it’s all hard facts that is not available to the general public.